In basic terms, Single Sign-On (SSO) allows users of your web site to log into your Forumbee community automatically, without needing to sign up and create another account. Implementation of SSO on your web site requires technical development skills. This article is intended to give the information needed for a developer to implement SSO to Forumbee from your web site. Once SSO is enabled you will find it in Admin → Settings → SSO. You will use this secret key later when you construct your URL to generate a SHA-1 hex digest. NOTE: You should keep your secret key private and never publish it. 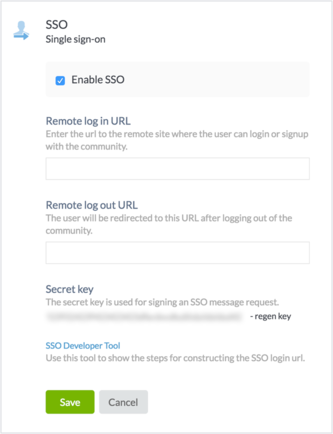 When you implement SSO you manage the login process for users into the community from your remote application. However it is still possible for a user to access your community directly, such as through a bookmark or a link in an email notification. When a non-logged in user accesses your community directly, they will be prompted to login. To transfer control of the login to your remote application, specify a remote login URL. When prompted to login or sign up, the user will be redirected to the URL you specify. This should be a URL in your remote system that allows the user to login or sign up and then passes them back to your community via SSO. If you have a private community and a non-logged-in user requests a page, the page URL is passed as a parameter on your remote login URL. When constructing your SSO link, you can pass this into the SSO redirect parameter to send the user to their requested page. When the user clicks log out in the community they will be sent to the URL you specify. Typically this would be a URL that also logs the user out of your remote system. The user key is passed (Base64 and URL encoded) on the Remote log out URL as a convenience for you to track the user. From your remote application construct a unique URL login link for the user that includes a Base64-encoded JSON object containing user fields as shown below and a message digest ensuring the validity of the data. Use this URL to redirect the user to the community or to present a navigation link to the user. During your implementation, use the SSO Developer Tool described below for documentation and testing. Your Forumbee subdomain or domain alias. Unique member key from your remote system. It is good practice to use this if you need the ability to make updates to the user email at a later time. Best practice: Do not to pass the role parameter unless you are assigning the moderator role or downgrading a moderator to a member. See User Roles section below for more details on roles. Comma separated list of private categories and/or groups to grant access. Destination URL to send the user after successful login. When not specified the user is sent to the community home. Custom profile fields are available as SSO parameters. The SSO parameter name is _fieldname where fieldname is the custom profile field name. Note that custom profile fields must be enabled for your community before they can be used in SSO. Contact your account manager or support@forumbee.com for more information. 2. Base64 encode the result of step 1. 3. Compute a SHA-1 hex digest by combining your SSO secret key and the Base64 result from step 2. 4. Convert the digest from step 3 and the Base64 data from step 2 into URL Encoded parameters. 5. 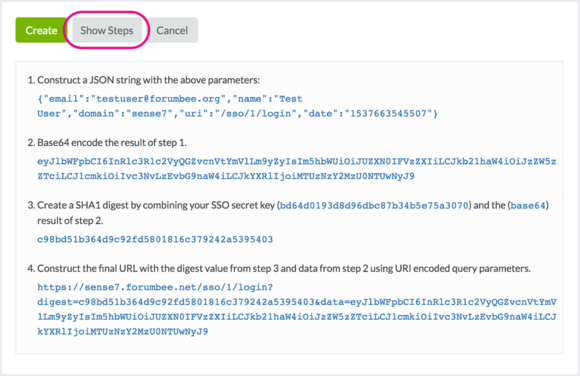 Construct the final URL with the digest and data from step 4 as query parameters. During your implementation, use the SSO Developer Tool for documentation and testing. 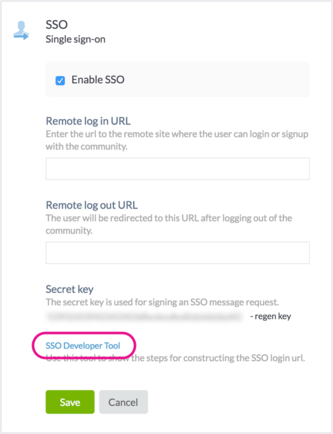 Navigate to the Admin area → Settings → SSO, and click SSO Developer Tool. To create an actual working SSO URL, enter test data in the fields and click Create. This returns the SSO login URL. Copy and paste this SSO link into a different browser to try it out. If you paste it in the current browser you are using, you will be logged out of your current session and logged in as the SSO user. Click the Show Steps button to reveal the steps to create the URL. Each step in the process is documented and output is shown. To test whether your SSO URLs are constructed properly, use the Validator. 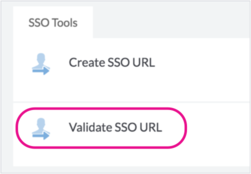 In the SSO Developer Tool, click Validate SSO URL. Paste the SSO URL and click Validate. The URL will be evaluated and a descriptive status will be returned. Source parameters will be deconstructed in JSON format. When a user clicks through on your SSO link, Forumbee will look for the user in the community based on their SSO key or email. If no matching user is found, SSO will create a new user with the SSO parameters provided. If a matching user is found, by default SSO will not update existing values for name, user-uploaded avatar, or tagline. If avatar or tagline were previously blank, or if the avatar was previously set by SSO, they will be updated by SSO. Janet previously joined the community, uploaded her avatar and created her tagline. Later she logs in with SSO. Her existing name, avatar and tagline will not be updated by SSO by default. This ensures that the edits she made to her profile are not lost when she logs in again with SSO. Ross previously joined the community, but did not upload an avatar or set a tagline. Later he logs in with an SSO link that includes values for the avatar and tagline parameters. His profile is updated with the avatar and tagline passed by SSO. If the SSO overwrite parameter is set to 1, it will update the user name, avatar and tagline with the values provided. It is a best practice to only use this parameter in cases where you need to reset a member. If no avatar is provided, it will revert the user avatar to the original setting. The original setting is Gravatar or the Forumbee avatar if the user originally established their account with an avatar prior to SSO login. If no tagline is provided, it will reset the user’s tagline to blank. One of the following roles can be assigned to a user with the SSO role parameter. Access restricted categories (forums) when granted access via SSO link. Monitor the community activity stream. Receive the community moderator report email. Manage the community moderation queue. Receive the moderator report email for that category. Edit/remove postings in that category. Manage the moderation queue for that category. 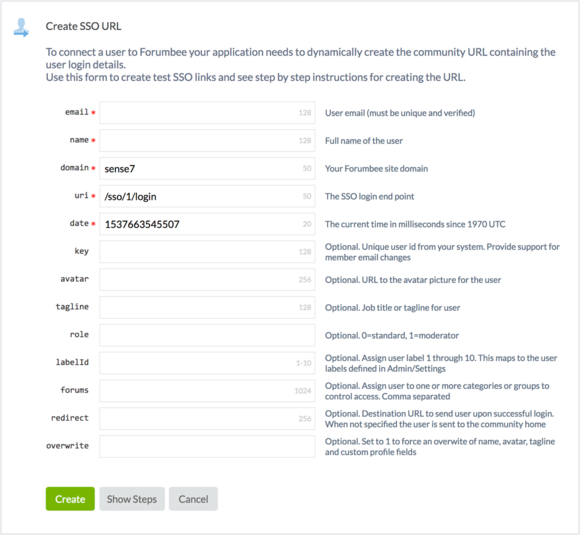 To assign a category moderator through SSO, set role to 1 and list the categories in the forums parameter. The user will be assigned as a category moderator to all listed categories. We're going to have a private Forumbee community. Most of our users' accounts will be initially created via SSO when they click through our software to Forumbee. If a user decides to go to the community via a direct URL, they will be prompted to enter their username and password. Since they do not know their password, how can the user access the site? Also, if they attempt to create a new user account but use the same email address that is associated with their account created via SSO, will the system create a 2nd user account or merge the 2 accounts together based on the email address? They would need to click 'forgot password' and follow the steps. They can then log in directly. if they attempt to create a new user account but use the same email address that is associated with their account created via SSO, will the system create a 2nd user account or merge the 2 accounts together based on the email address? The system merges the 2 accounts together based on the email address. Note, if you would prefer that users not be able to log in directly, you can enforce SSO login. To do this, configure the SSO remote login and logout URLs to go to your application login/logout pages. I tried following the instruction to turn on SSO and do not see the option. Does SSO functionality need to be turned on by forumbee before I can see it in the settings area? Specifically, I am following the steps below and do not see "SSO" under settings in the Admin area. To enable SSO, navigate to the Admin area ⇒ Settings ⇒ SSO, check “Enable SSO” then click Save. Hi Autumn , thanks for your question! SSO is now enabled for your account. Let us know if we can help with any other SSO questions. Thanks! SSO looks great however we require that an account is created in our instance when the user creates an account in our framework. Is there an api to do such a thing? Hi Ilan, you should be able to make a server side call to the same SSO link to create the user at any time. What I don't get is how I set the password for the user. We want to be the same password as the one created on our end. Hi Ilan , we don't support sending passwords directly. Instead, the typical pattern for this is to provide the SSO link to the user at the time they access the community so that they do not have to log in again. You would use this in conjunction with the remote login link that points to your login handler. This means that if the user accesses the community directly and clicks 'Login' they will be routed to your login page. Can you provide a link to documentation that works? I found documentation, but the screens have changed and it does not work. There are no SSO settings under Settings->Account that I can see. Hi Mark , thank you for your post! The SSO feature is now enabled for your account, and you will find it under Settings -> Account.